NEW YORK, NEW YORK — What began as Josh Marshall’s personal blog during the Florida vote recount of November 2000 has since expanded into a profitable multimedia brand of fast-paced political news coverage. The TalkingPointsMemo.com homepage now acts as a conduit to several different frequently-updated news sites and blogs, a poll tracker, and a video channel. 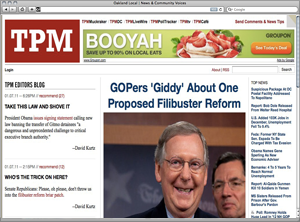 Popular topics for TPM coverage include economic policy, lobbying, health care, campaign trends, and election polls. Not only were the major dailies slow to pick up on the controversy, but a Capitol Hill staffer says that the House Judiciary Committee itself would have missed the firings’ significance if not for the barrage of reports from Talking Points…. When Alberto Gonzales, Kyle Sampson, and Monica Goodling testified before Congress this spring, they had the reporters in this obscure Flower District building to thank for the honor. In 2008, TPM became the first online news site to be honored with a Polk Award, which it won in the legal reporting category for its work on that story. TPM distributes and publicizes its content widely on Facebook and Twitter, and also has a (cashless) content-sharing deal with Gawker, CQ Roll Call, and Business Insider–a reciprocal agreement to trade and reprint a certain number of stories each week. Aside from individual donations and individual investments into TPM Media LLC, most of the site’s funding comes from paid advertising. According to Marshall, direct ad sales have increased by about 650 percent in just the past two years. In the fall of 2009, Talking Points Memo opened a Washington, D.C. bureau to better cover the capital. The company currently has an overall editorial staff of twelve, with plans to expand those numbers considerably in the next several years, according to Marshall. But, Marshall said, that doesn’t mean they will lose touch with the community of readers that has fueled the site’s growth. City: New York, N.Y., with a bureau in Washington, D.C.